OnCrawl is a well-argued response to the various unitary software specializing in SEO on the market. It owes its reputation to its ability to deal 360° with all the themes of natural referencing. 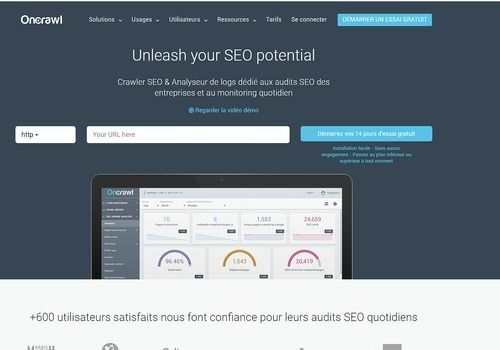 Its crawler allows you to obtain an accurate report on the condition of the pages and structure, in order to identify errors or problem pages, and also to correct certain defects. The log analyzer, on the other hand, focuses on tracking bot paths and provides valuable information on which popular pages to focus on, and which ones not visited, which may need to be avoided. The SEO Impact report combines the data collected by the crawl and provides a numerical dashboard of all observable parameters, so that the referrer can start his work on substance... or form! OnCrawl offers several subscription packages but 14 days are offered for the trial. Majestic data is included in some packages, so it is possible to bypass this license if you use the unified solution. Although the site details all the features, it is better to test the software before deciding, especially if you work in an agency.